Teachers and staff put down the strike signs and dedicated a day of service on September 11th. Mulching the East Orchard was done right even without a lesson plan! With the many hands making light work, the groups resolve was fittingly wrapped up on time and the East Orchard looking like an ‘A+’! Our kids are in good hands, thank you teachers and staff. 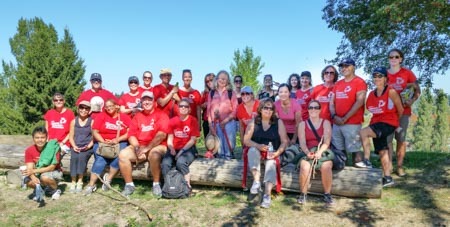 Striking teachers gather after a day of service in the East Orchard. Looking good!